Roche Point Furnished 2 Level 2 Bed 2 Bath Condo w/ Water Views $4500 — Lynn Swanson At a glance guide to all currently available fully furnished properties managed or represented by Sunstar Realty Ltd. Lease term: minimum 4 months stay. Included items: fully furnished from cutlery to linens, from plasma TV to designer soap dispensers; fridge, stove, dishwasher, washer, dryer; also includes maid service, utilities, telephone, cable, and internet. Amenities: Raven Woods clubhouse: theatre, fitness centre, sauna, party room with kitchen, outdoor patio, pool table, private gardens & courtyards. LOCATION: The private community of Raven Woods is located in the desirable Deep Cove-Seymour area at Roche Point. From here, the land gently slopes down to Burrard Inlet and just around the corner to the world-renowned Indian Arm. Beautiful beaches, miles of hiking trails and nature parks abound in this breathtaking area. Located close by are two recreation centres, three golf courses, Dollarton Shopping Centre and Park Gate Shopping Centre. Golfing, skiing, kayaking, biking are just some of the many activities available year round. 20 minutes drive to Downtown Vancouver, 30 minutes to Cypress Mountain and 90 minutes to Whistler. FEATURES: Award winning Seasons at Raven Woods offers a serene setting with quaint bridges cross over a series of landscaped lagoons, private gardens and gently-lit pathways wander throughout. 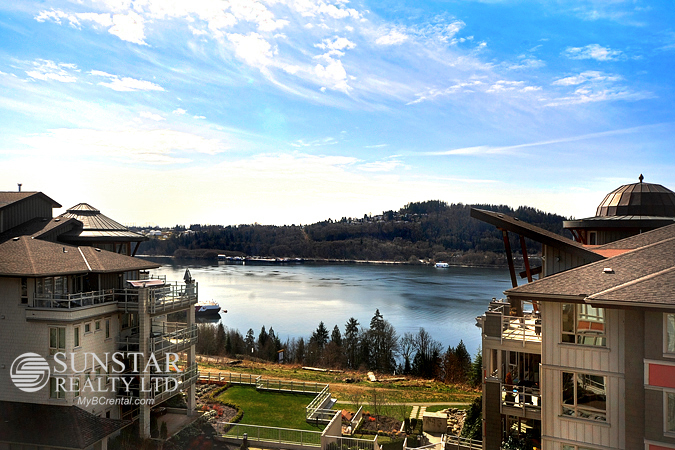 The interplay of slanting sunbeams over a forested North Shore hillside overlooking a stretch of Burrard Inlet on the river banks complements the luxurious and finely crafted homes of this resort development. This 1262sf, 2 levels, 2 bedroom + loft, 2 bath condo offers dramatic 20' vaulted ceilings in the living area, a gorgeous view of the hillside complex and water views of Burrard Inlet. Sunny south facing living and dining room has gas fireplace, access to a large sundeck and striking glass walls with a view. Kitchen features hardwood floors, stainless steel appliances, granite countertops and breakfast bar. Master bedroom comes with master balcony with a view and a 5 pcs master ensuite. 2nd bedroom also comes with a view. 3 pcs main bathroom and insuite laundry completes this floor. Upstairs is the loft office overlooking the living area below. 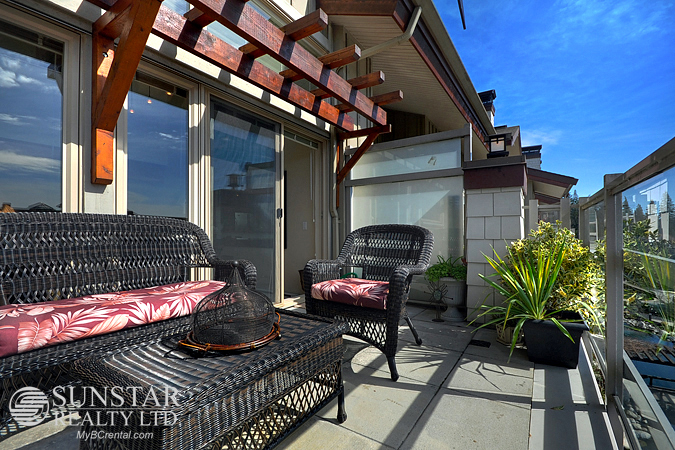 North Vancouver Furnished Condo - Sunstar Realty Ltd.